When he came to Lynchburg, Weaver said he knew he’d be involved on campus, but not exactly what that would mean. His first on-campus job was with Dr. Sally Selden — Weaver calls her “Dean Sally” — who is Lynchburg’s vice president and dean for academic affairs. This led to other opportunities, including serving as the student representative on the faculty committee that developed the new DELL general education curriculum, which takes effect in 2019. Weaver also joined the student judicial board and then the Student Government Association, where he currently serves as one of the organization’s two vice presidents. “I’m very, very fortunate, for going to a small school, being in those organizations, having the opportunities I had, and making the connections I’ve made,” he said. 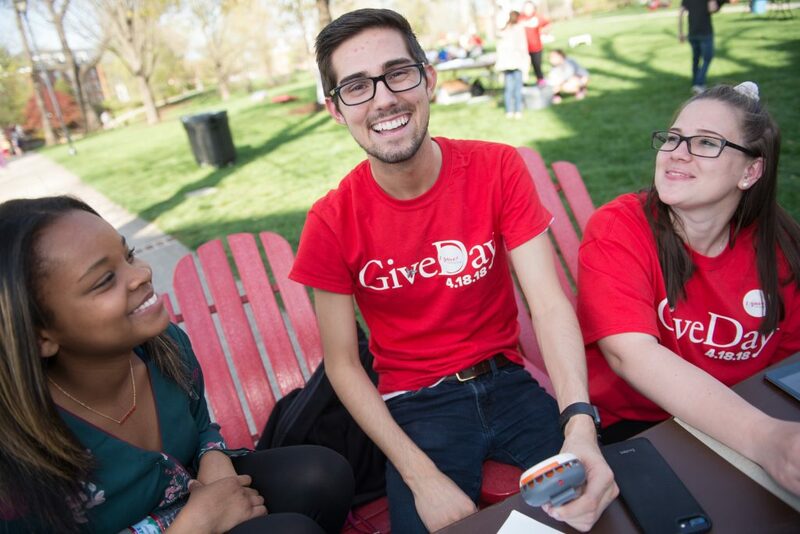 Wyatt Weaver ’18 (center) with friends on Give Day. Asked about people who stand out from his four years at Lynchburg, Weaver was ready with a list. In addition to Dr. Selden, who he said has been “instrumental to my professional growth,” Weaver formed a tight relationship with Dr. Selden’s executive assistant, Wendy Martin. Weaver credits B.J. Keefer, director of student activities, with encouraging him to stay involved in student government. He added that she, like Martin, is someone he can go to with both good news and bad. And then there are his friends, some of which hailed from unexpected corners of campus. “In high school, you have your cliques, and if you’re not in the right one, it’s devastating for four years — the whole typical high school movie experience,” he said. “But in college, you have those cliques, but they all mesh together, which I think is awesome. After a summer spent supervising lifeguards at a resort near Williamsburg, Virginia, Weaver will head to High Point University’s Fred Wilson School of Pharmacy. There he’ll pursue a doctorate in pharmacy with the goal of becoming a hospital pharmacist.